My Global Ed class is composed of fifth and sixth grade girls who meet at lunch/recess to try to make a difference in the world. If your daughters have come home and asked for plastic bags, empty water bottles, yet another batch of brownies for a bake sale, a shovel for ditch digging¾be assured that they are in the midst of one of their collaborative projects, two of which have become part of the Middle School curriculum. 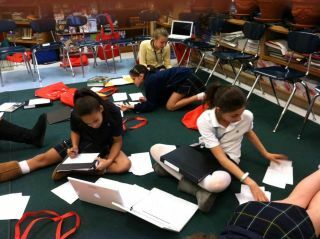 By working with partner schools from Pakistan, Taiwan, Australia, and Belarus via Skype, students had the opportunity to practice netiquette, writing skills, and communication. As a result, SCH students developed close relationships with two schools. One is the Al Ameen School in Dubai, led by teacher/principal, Fatima Martin, and the other is the Village Charter School in Trenton, NJ, led by Deanne McBeath. My students have learned about how food is grown and distributed in different countries, how poverty affects the foods we eat, and how to better understand the serious nature of not having enough food. Inspired by these lessons, my students have collected survey data about different ideas for developing hunger solutions, worked with the Middle School Service Board to raise money and awareness about hunger locally and globally, and held an assembly for Lower School students to share their knowledge and understanding. In Skyping with our partner schools, our students have had the opportunity to share their work, ask questions, and share thoughts with students their own age who are working toward the same goals. Water bottles. Plastic bags. Quick-drying cement. Chicken wire. Yes, we constructed a walled garden out of “bricks” made out of recycled plastic bags and water bottles. Our plan is to continue the construction in the fall and finish with a small solar greenhouse. While the girls earned the money for mortar, tools and plants, they spent the winter months indoors making approximately 300 bricks. In March they dug ditches, learned to mix and lay cement and mortar, and finally planted small seedlings by the end of April. The harvest in June was small, but was happily given to Chosen300, an organization feeding those in need on a daily basis in Philadelphia. In this way, Finding Solutions to Hunger works hand-in-hand with YouthCan. We were able to share our work at the international iEARN YouthCan Conference in New York City in April. We sent and received cards for the Chinese New Year, Christmas, Hanukkah and Kwanzaa, Valentine’s Day, Thanksgiving and New Year. The girls loved creating cards in celebration of holidays celebrated in the United States, sharing them with global classmates in countries that included Taiwan, Slovenia, Bangladesh, Australia, and the United States. We researched American Culture from 1912-2012 and also interviewed relatives and elder friends to find out what events influenced their lives, what they remember of childhood, and how they look back at life in other periods of their lives. We posted our final research letters, and shared our own country’s history with students conducting similar research in Pakistan and Australia. One of my favorite moments occurred following the first Skype session we had with our close partner school in Trenton. At the close of the session, I watched as our girls held their palms out to the computer screen in a gesture of good will, and the Trenton students held theirs out as well. Good-bye Partners, they called to one another. Mary Legato Brownell teaches at Springside Chestnut Hill Academy in Philadelphia, Pennsylvania.